Not liking Edward Tulane is one thing. Not liking Edward Tulane AND The Wright 3 is another. But not liking Edward Tulane AND The Wright 3 AND Weedflower would probably seal my doom. Fortunately, I found myself nicely surprised by the last of the three. Full-disclosure time. I did not like "Kira-Kira". I respected what author Cynthia Kadohata was trying to do and I understood where she was trying to take her book but I did not respect how she did it. So when a co-worker I trust handed me, "Weedflower" and said, "It's actually good", I eyed the title with a critical eye. It takes a very extraordinary book to lift me out of my own personal prejudices and win me BACK over to a writer. That said, it seems that Kadohata has written such a book. Insightful, intelligent, historically accurate, and chock full of well-timed and well-written little tidbits, I've not found myself wanting to keep reading and reading a children's book this good in quite some time. Undoubtedly one of this year's rare can't-miss titles. Sumiko is just thrilled. She's just been invited to her very first birthday party with all the other children in her class. Though she lives in California on her aunt and uncle's flower farm, Sumiko doesn't know a lot of other Japanese-American children at her school. When she arrives at the party, however, the mother of the birthday girl turns her away from the house. Not long after this humiliating incident, Pearl Harbor is bombed. Now Sumiko and her family members are getting shipped off to an internment camp for the duration of the war. They eventually find themselves in one located on an Indian Reservation in Arizona. The Japanese-Americans don't want to be there and the Indians don't want them. Still, while fighting boredom and the apparent death of her dreams, Sumiko is able to meet one of the Mohave boys that make deliveries to the camp and strike up a tentative friendship. Dealing with issues as heavy as how to survive without your basic Civil Rights and balancing them with stories of growth, mischief, and frustration, Kadohata intricately weaves together multiple strands of narrative and story to serve up a tale that is wholly new and engaging. Flower farmers don't get much play in kids' books. Ditto Japanese internment titles that discuss the Poston internment camp. On the bookflap we learn that Kadohata's father was held at Poston during WWII and that his experiences provided the impetus for this book. Most remarkable is how deftly Kadohata is able to give her characters three-dimensions while still filling in just enough story, facts, and background to provide for a well-rounded novel. Though it slows down a little at the beginning, "Weedflower" hits the ground running once Sumiko finds herself turned away from the birthday party. That small piece of foreshadowing is such a wonderful little way to begin the book with a feeling for things to come that you almost wonder if it happened to someone Kadohata or her father knew. Of course the really remarkable thing about "Weedflower" is that you feel the threat the Japanese-Americans were under without ever having to see violent or particularly nasty scenes. It's the mark of a good children's writer when the author is able to convey danger without relying on shock or cheap theatrics. A true class act. Not that Kadohata doesn't occasionally slip back into bad habits. The bulk of my dislike of "Kira-Kira" was based on the author's tendency to pile on the despair. Things get bad, and then the author will write a sentence or a paragraph that just milks the misery for all it's worth. As far as I could ascertain, that only happens once in this book. At one point Kadohata says, "Some nights Sumiko felt too sad to be inside listening to everyone breathe. Tak-Tak's nose was often stuffed, and Sumiko hated to listen to him struggle for freath. She imagined his lungs brown with dust. And Auntie was so depressed about Bull and Ichiro leaving that she cried for hours at night. Sumiko thought there was nothing in the world sadder than listening to someone cry for hours. It was even worse than your own tears". But such sections are few and far between. For the most part, Kadohata knows how to show and not tell. She's at her best when she makes it clear how the "ultimate boredom" a person can succumb to can kill your will to do anything. Idle hands are the devil's playthings indeed. Actually, I've a bit of a beef with the cover. Sure, a shot of a pretty Japanese-American girl looking through barbed wire while wearing a kimono is a nice idea. But when on earth does Sumiko wear a kimono in this book? I remember that she owned one and that she pushed it to the back of the closet back in her California home but mostly when she wants to dress up she wears an increasingly bedraggled mint green school dress. Yet apparently the publisher didn't think a kid wearing anything less than a piece of symbolism would do. I would have much preferred to have seen Sumiko in normal school clothes, but there's no denying that while it may not be accurate, the cover of this book is rather stunning. A cheap shot, but stunning. There are quite a few children's books that discuss the internments of WWII. The one that I kept thinking back to while reading this book was, "Invisible Thread" by Yoshiko Uchida. Uchida's book is based on memory and is good for what it is. It just so happens that Kadohata's book may be significantly more powerful in part because she doesn't have to adhere to her own memories and in part because the situation her father was in works so well in a children's book. A book published the same year as, "Weedflower" that also follows a forced internment at the hands of the U.S. Government is Joseph Bruchac's good but long, "Geronimo". Both books have a great deal in common, but Bruchac weighs down his narrative with too little editing whereas Kadohata keeps, "Weedflower" hopping along at a fast clip. 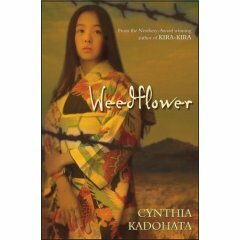 I wish I could swamp "Weedflower" for "Kira-Kira" and make IT the Newbery winner of 2004. Ah well. As it stands, I recommend it to any and all kids forced by their schools to write a book report on a recent book of historical fiction. This is one of the more charming titles out there, and definitely will be making quite a few Best Book lists for 2006. Lovely lovely lovely. If you liked "Weedflower", you need to read "Dear Miss Breed" by Joanne Oppenheim. 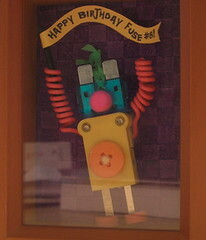 It is about a San Francisco children's librarian who sends books to her interred patrons. It's told partly through the letters the kids and teens wrote to her. Very powerful. Amazingly, many of the kids and their families were sent to Poston. It makes a nice factual piece to pair with "Weedflower". Good point. I've seen "Miss Breed". It's actually sitting in my boss's office waiting for me to read it at some point. But I'd forgotten all about it. A perfect pairing with "Weedflower", I agree. I think the cover reflects the current YA interest in ALL thing Japanese. The publisher is hoping to attract the manga readers, I daresay. It is a lovely cover. Even so, most manga characters these day are pictured in contemporary school uniforms. It could have been remarkably easy (and accurate) to dress Sumiko up in one of those if they were hoping to catch the eye of modern teens. No matter how you slice it, it's still baloney.